Been a bit quiet here, mainly because I’ve been writing and rewriting parts of chapters 3 and 5 and fuelled for the most part by caffeine, discounted creme eggs and irregular sleeping patterns. It’s not been pretty. 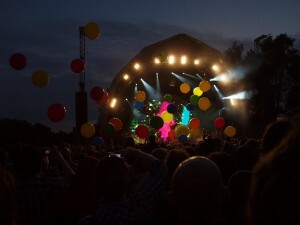 However, I did manage to get to Live from Jodrell Bank, tickets purchased for my birthday by my favourite little sister. 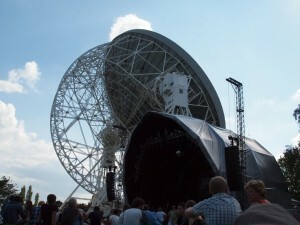 As the name suggests, it took place at Jodrell Bank and the stage was in the shadow of the Lovell Telescope itself. The Lovell telescope is an impressive structure and seeing it surrounded by people and bathed in glorious sunshine was definitely a change! There were also interesting people wandering around. 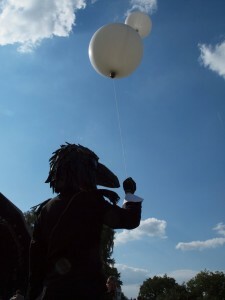 The chap in the photo below-right was dressed in black, wearing a large crow’s head and clutching two large white balloons. We saw him around all day but didn’t manage to work out what he was doing (apart from looking dramatic). The new visitor centre was open and my friend Liz and I had fun playing with something that resembled an old charity money-spinner. It looked like a large black funnel, and you started rolling a ball at the top. The ball would spiral down the funnel until it dropped out of the hole at the bottom. You could then retrieve your ball and do it all over again – multiple times if you’re a small child fascinated by such things or, indeed, two twenty-somethings. It was also fun sending one ball clockwise and the other counter-clockwise and either trying to get them to crash into each other or avoid each other but I’m almost positive this was not the point of the exercise! The point was that this simple model helps we, the general public, understand how black holes work in a fun and hands-on way. People of all ages could engage with it, although the baby we saw there was more interested in chucking the balls straight down the hole! The map showing different telescopes around the world was striking and really illustrated how the Jodrell Bank Centre for Astrophysics (JBCA) is part of a global community of researchers. It also offered information on the different types of telescopes and showed how the facilities used by the JBCA, such as the e-Merlin network, fit into a wider context. 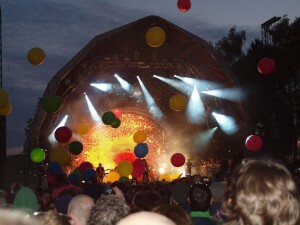 The line-up was Alice Gold, The Waves Machines, OK GO, British Sea Power and The Flaming Lips. I was especially looking forward to British Sea Power – there’s an endearingly wide-eyed wonder about the natural world in their music; they’ve written a song about a collapsing coastal Antarctic shelf and light pollution. One of the songs they played was the rather appropriate Observe The Skies which I think they dedicated to the Lovell Telescope. British Sea Power are known for decorating the stage with foliage and the appearance of a large bear. This time there was a bear fighting a robot/microwave. The Flaming Lips put on an entertaining show, incorporating giant hamster balls, lasers, balloons filled with confetti and close-ups of Wayne Coyne’s nostrils. They wanted to mess around with intros and the audience wanted to sing along so there was a lot of “wait for it, wait for it…wait for it…” going on. I’m far too sleepy to attempt to interpret their lyrics, but Race for the Prize might be about two scientists and Do You Realize?? informs us that we are floating in space. I was standing just in front of Jen so was treated to the physicists arguing over how they did the lasers and what constellations and planets we could see. Astronomers are interesting people to know when you’re standing in a field at night! As well as being an interesting and unusual music event, it was also an effective outreach event. PhD and postdoc researchers were on hand with science tricks, there were short talks throughout the afternoon by astronomers and Dr Tim O’Brien took to the stage to talk about the kind of research that takes place at Jodrell Bank. He played recordings of pulsars and people were cheering and clapping in time with them. It’s probably the first time I’ve heard people chanting SCIENCE SCIENCE SCIENCE at a gig. 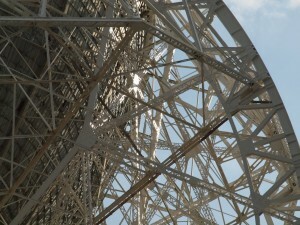 There was something joyfully and unapologetically geeky about it: there was an atmosphere of “we’re at a gig under a radio telescope, isn’t this amazing?” As Jen said in her talk, science is about having that sense of wonder and curiosity about the universe and trying to understand it better. There’s nothing uncool about that. Of course it made me think about what linguistics could do. While communication is a fascinating thing, we collect our data from people, not the vastness of space. Unfortunately the hard drive where my corpora are stored or a digital recorder aren’t as dramatic as a telescope, especially one as iconic as the Lovell. Instead, I reckon we should reverse it: instead of trying to find a suitably research-intensive location for the gig, I reckon we should make the gig research-intensive and record band-crowd interactions or something. Space and stars also inspire people to write songs about them. While Massive Attack deserve a mention for “love, love is a verb; love is a doing word” in Teardrop and The Indelicates for “You know exactly how clever sounds, the soft consonants and rounded vowels” in Jerusalem, I’m kind of drawing a blank on linguistic songs. I did, however, find a paper on a corpus analysis of rock harmony so that’s something, right? Any suggestions for linguistics songs? Are there any for your area? What would your dream outreach event be?